According to my climbing schedule, Aconcagua was up for 2019. After successfully summiting Mount Elbrus and Denali, it was now time to climb the highest mountain of the Americas. However, Aconcagua is not the most difficult mountain. And since I am always looking for a nice challenge, I decided to not climb the normal route. I decided I wanted to have a go at the Polish Direct Route. The Polish Direct Route heads straight up to the Polish Glacier and is only climbed a couple of times each season. I knew this would be a good challenge for me. The glacier is there, other climbers have done it before, so why wouldn’t I be able to climb it? Before climbing the Polish Direct Route, I first had to get to Aconcagua and then to the bottom of the Polish Glacier. I decided to do this using the False Polish Traverse route, which starts in the Vacas Valley. This route is longer than the normal route but much more spectacular. I followed the False Polish Glacier route all the way up to High-camp, where the route connects with the Normal route. Summit day is for both the False Polish Galcier and the Normal route the same. In other words, using the False Polish Glacier route, you traverse Aconcagua once. To get to the Polish Glacier, I first followed the False Polish Traverse all the way up to High-camp. However, from High-camp I travesed back to the bottom of the Polish Glacier where I would start my summit attempt. The total climb took us about 14 days, including one planned restday and one weather day. The descent took us 2 days. Once we got to High-camp, we need to set up our tents before we finally got some rest. We have done this several times before and it’s has become and efficient routine. Martin, my guide for summit day, and I decided to sleep in the same tent, as we will leave an hour before the rest of the group does. It feels kind of strange to switch tents for me. I know this will help me focus on the challenge tomorrow. But I have also built up some routine with my old tentmates that I hate to lose now. From now on my climb will be different for a day, and I got to get used to that. Once the tent is all set and done, I get in my sleeping bag as soon as possible. I know it will be hard to sleep at this altitude. But every piece of energy I safe now will help me tomorrow. I wake up at 3 in the middle of the night. Stoves are fired up to boil some water. It’s also breakfast time, but I always find it hard to eat anything when I wake up in the middle of the night. The current altitude, of above 6000 meters, makes this even harder. With some effort, I managed to eat something and drink a cup of tea. The rest of the water is for my thermos. Hot tea, with lots of sugar, will definitely help me during the rest of the day. After having breakfast and preparing, we leave our tents at 4 in the night. We first need to make a long travese from High-camp to the glacier. Martin told be that he wants to keep a good pace and not have a lot of breakes untill we actually get to the glacier. Once we are at the glacier, we have plenty of time and can take all the breakes we need. Because of this, I expected Martin to start with a high pace. However, to my own suprise, it takes me little effort to keep up with Martin. Ofcourse you don’t want to run up the mountain, for sure not at our current altitude. But our pace is just easy, and i didn’t expect that! The only this that bothers me is that my fingers are cold. I am wearing my thickest gloves, but still lost feeling in my ring- and little finger. I try to force some blood to my fingers by continually squeezing my trekking poles with my fingers. Hopefully, the will get back to live with this! Tough winds on the Polish Glacier! Our climb starts on the same trail as the rest of the group will climb. It’s still dark outside, and I am wearing my headlight to see anything. That trail is easy to find and comfortable to walk. But, after 45 minutes, we take a sharp left and leave the trail. This is where our traverse starts, and from now on we will need to find our own trail. I know this is the moment my climb actually starts and feel excited! It’s not easy to navigate while it’s completely dark. We sometimes need to go back a little and find a new route. 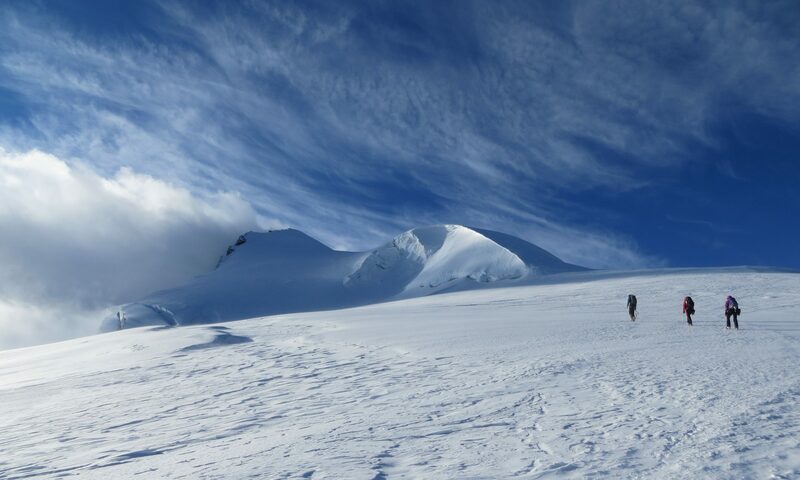 But after a while, we get to a huge snowfield which is the marker to put on our crampons. After the snowfield, we enter the scree. Aconcagua is covered with a lot of scree and it’s not easy to walk on. With every step you take, you have the risk to start a slide and fall. Luckily, our crampons add some stability. While it’s hard work to move forward, it’s not as bad as I expected. Meanwhile, the sun slowly sets. We are following a band of rocks, and just on the bottom, we see an excellent and comfortable spot to have a break. We sit down for a while and just enjoy the views. The loneliness and endless views are both just awesome. To my right, in the distance, I can see some headlights of other climbers following the normal route. I love this moment and I am fully enjoying it. The mountains are so beautiful, and they are fully showing it right now! We are climbing for about 2 hours now, and it’s another 30 minutes untill we get to the Polish Glacier. By the time we get there, it will be completelty light. My watch showes we are above 6300m. I now understand why my legs are a bit tired already. Climbing in the scree is still tough, and breathing is not getting any easier either. After about 30 minutes we have a full view on the Polish Glacier. It’s the first time I see it from realy close. Thatis a pretty steep and long climb! I know we need to gain 600 meters on the glacier and estimate it’s about 60 degrees. The ice wall makes an impression, but I feel challanged! Both Martin and I notice the glacier is in perfect condition. We don’t see any blank ice, meaning we don’t have to create any belay points. That will save us a lot of time. While climbing the glacier we will pass two rock bands. I am thinking that 600 meters of climbings could mean 6 breaks and 6 times 100 meters of climbing. That sounds feasible, let’s go for it! It doens’t take m every long to realize that only 6 breaks it way to ambiteus. After we started on the glacier, the climbing didn’t exactly get any easier. And the air is getting thinner and thinner. I am suffering, and now that there will be a lot more breaks than 6! Use the rope? Or not? We knew the fixed line would be there. I said before I didn’t want to use it. I want to climb this route with as little support as possible. I’m OK with using a rope for safety, but not to ease the climb. At the bottom of the Polish Glacier. This is where is all starts! At the end of the break I do grab the fixed line, and decide to put me ego aside for now. I’m suffering, bad, and know that even with support of this fixed line, the climb will be hard. So any support is welcome right now. But while climbing, I notice there is not a lot of support from the fixed line. We climb on our hands and feet, and pulling the rope to get up easier just doesn’t work. What does help is that there are nice little footsteps in next to the fixed line. Because of this, I don’t have to kick my crampons into the ice to get a good step. And that saves a lot of energy for me! But despite this little advantage, my calves are burning badly and I am constantly breathing heavily to get the oxygen I need. Some stretches we do are good, and we have nice progress. But sometimes I have to stop climbing again after only 5 steps to catch my breath again. We slowly get to the second rock band. This is where is fixed line will be very helpfull. We need to climb some mixed terrain with is 90 degrees steep. Normally, I wouldn’t have any problems with this, but at this altitude, it’s a little different. Luckily, we pass the steep part easily, but I definitely need a break after it. I completely lost my breath again and need some food and drink. I feel completely wasted, but also know it’s only another 100 meters until the end of the glacier. And, in this last part, the glacier will slowly ease in steepness. I get the feeling we are going to make it! High-five Martin! But the last 100 meters still are not easy. I feel I need to stop more often and my breaks are getting longer and longer. My thoughts are heading the wrong way! I start to doubt if there is an end to this glacier and if I will ever reach it. I question myself if I am really having a good time now. My calves are burning so bad and I am constantly out of breath. My whole body screems it’s enough. If we have a break, I need to eat and drink. But even eating and drinking is a struggle. I know I need the energy, but I just don’t want to eat and drink. So is this what I really want? Is this what I like? YES! This is what I want, this is why I traing almost every day, and this is what I live for! Aconcagua may hurt me so much, but I will summit!. I can do this, this is what I am good at! Stop whining Bart, and start climbing again! We finally reach the end of the Polish Glacier. I feel we completed our mission, but we are still not at the summit of Aconcagua. That’s another 2 hours! But luckily not very steep and basically just an easy walk. After reaching the top of the Polish Glacier, we first take a long break. We will no longer need the ice axe and the helmet, and I decide to get my trekking poles out again. During the last part, I take a lot of short breaks to eat and drink. I know I am almost at the summit, but that’s only halfway. I still need to descend back to high-camp. That worries me a little because I feel completely wasted. Once we get to the summit, we are welcomed by the first part of the rest of the team. They just got here 15 minutes before we did. They are obviouly very pround at Martin and me for climbing the Polish Glacier. All the congrats I get make me realise I really did it. I climbed Aconcagua via the Polish Direct route! But I feel so tired. I need to sit down and take a moment. Everybody is psyched and taking their photo’s. But I just need a moment. I am dead tired, but happy. I did it! I feel a tear coming down my cheek. I really did it…But I still need to descend all the way back to High-camp. Ofcourse it’s awasome to read about my Aconcagua climb, but it’s even better to see it! That will soon be possible. I am working very hard to create a movie of the climb, but it will still take a while to finish. But, fellow climber Remy Kloos already finished her video, see below! I really want to thank the team for making the climb an unforgettable experience. We had so much fun which is one of the most important things during a good climb. Of course I would like to thank guide Martin for his support on the summit day, and Mike Hamill from Climbing the Seven Summits for making this climb possible. Time has come to climb again, and it’s about to happen! Yesterday I had a long day of traveling and switching planes. But, in the end, this all resulted in being here, in Mendoza, Argentine. And as you probably know, Mendoza is the place to be if you want to climb Aconcagua. Aconcagua offers multiple routes where, of course, the normal route is most used. This is a non-technical route that offers little challenges other than the altitude. And that should definitely not be underestimated. Aconcagua is almost 7000 meters high which still makes this a serious climb. As said before, I will attempt to climb Aconcagua via the Polish Direct Route. This route is much steeper and offers a lot more challenges than the normal route or the standard traverse. Until now, all my preparations were always going as planned. For Denali, I discussed them quite extensively on my blog. Since this was working really well for me, I planned to continue like this. Roughly 5 runs a week and one or two strength training to keep my core strong. However, this autumn I had some serious injuries on my feet and lower legs. So I had to take more recovery time than I planned for, and missed some of the exercises I wanted to do. So, am I as well trained as I was for Denali? I don’t think so. Am I fit enough to summit Aconcagua? Yes! I do feel ready and are committed to summit. Maybe I will suffer a little more, but that will persevere! More good news! As you may know, I am a Mountainreporter, and that got me a nice sponsorship for Denali. While Nigor is no longer with us, we were able to get a far better one. If you take a close look at the clothes I am wearing om my climbs, you’ll notice that it’s most of the time from the same brand; Haglofs. After my Denali video report, they must have noticed that as well and decided to support me on my Aconcagua expedition. How cool is it when your favorite outdoor brand is sponsoring you!! But there is more. If you think of excellent down jackets, chances are you are thinking of Rab. Well, apparently they also thought of me, since I will be testing and reviewing one of their jackets as well! That’s all for now! I will be on Aconcagua for the upcoming days and will not have access to my laptop, or have an internet connection. I will be back with a trip report, both in text and video. Hold on! Let’s get ready for some climbing again. The Aconcagua seasons starts officialy in December, but I need to way for February 2019 for my start. Do I feel ready? Yes! Nervous? A little maybe. Feeling like wanting to start tomorrow? Yes, let’s rock and roll! The first thing I needed after Denali was time to recover and rest. Step away from the everyday trainingroutine and take time time to sit back and relaxed. Unfortunately, I am not to good at that, and it only took two weeks before I started picking up some training again. First just some relaxing bike rides of running, but they started to get more serious and serious. So it did not take long before I decided to get back to a structured way of training. I started a running program that would lead up to a full marathon. Ambitious, but that is what I like. Training was well and I registered for a half marathon on 30 September (Halve van Haarlem). Let’s do that half marathon! The days before the half marathon I felt awesome, but a little insecure. It would be my first half marathon, and I was wondering how much time I would need. Racing day itself was just another great day; sunny, not to much wind and just about 20 degrees celcius. Awesome! I started just about in the middle of the field and I felt great. The first part of the race I spend a lot of energy on overtaking other runners, and sometimes needed to jump on anf off sidewalks. The second part of the half marathon was much better and I was at full speed. It took me just a little over 1:35 to finish the race. Very satisfied and knowing that a sub 1:30 is definitely possible with some more racing experience. However, now it is time to fully focus on the upcoming climb; Aconcagua! Almost everything is in place. Expedition and plane tickets are arranged, and I just need to take care of some final details. The first early trip reports are already on Facebook, but so far the weather has been realy bad. Summiting has barely been possible so far. But, let the weather be bad now, so it will be good when I start climbing! Have you found your limit? I will find mine! Maybe while climbing the 7-Summits, maybe at some other place. Join my journey and find yours!